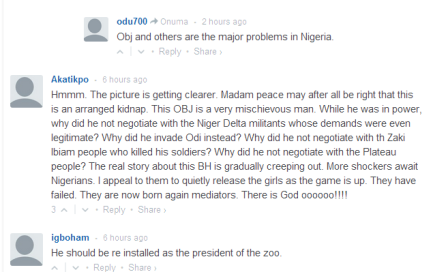 Do You Consider Obasanjo’s Moves To Free Chibok Girls Disrespectful To Mr President ? In a report from VANGUARD, Obasanjo accuses President Jonathan of not listening to him and not following the conditions laid out by Boko Haram group to end their atrocities 3 years ago. The former president in an exclusive interview with Vanguard reveals that he is making plans to free Chibok girls and also said the Borno state Governor was ready to end the insurgency 3 years ago but was afraid of the President Jonathan and his people labelling him a ‘BOKO HARAM MEMBER’…..
Former President, Chief Olusegun Obasanjo has launched a move to free the more than 200 girls kidnapped by the Boko Haram sect from Government Girls Secondary School, Chibok, Borno State. Obasanjo, who confirmed this to Vanguard last night, however, dismissed reports credited to a foreign news agency that he held talks with representatives of the sect in his Ota farm last weekend. President Jonathan’s dismissal of the group’s capacities, he said, was despite the willingness of Governor Kashim Shettima of Borno State to do all that was required by the sect for peace to reign.He nevertheless confirmed that he was set to open explorative talks with the Islamic sect, having re-established contacts with a lawyer who mediated his discussion with the sect three years ago. Chief Obasanjo, however, regretted that efforts he made to end the insurgency at that time came to nought after President Goodluck Jonathan dismissed the conditions and capacities of the group. Obasanjo, who has been globally acclaimed for his role in peace mediation especially among troubled African countries also played down claims that the insurgency would not have reared its head were he in power. The foreign news agency had reported, yesterday, that Obasanjo held talks with representatives of the insurgents in his farm at Ota, Ogun State last weekend. Asked to confirm the veracity of the report yesterday, the former president said: “Three years ago I tried to reach out to Boko Haram to find out what their problem was and if there was a leader one could talk to. He said that he subsequently passed on the conditions set by the insurgents to Governor Shettima who pledged his willingness to do all and more of what the insurgents required. “He told me he was willing to do all that was stipulated and even more, but that his fear was that once he implemented those conditions he would be accused by the president and his people of being a member of Boko Haram,” Obasanjo quoted the governor to have said after the initial talks three years ago. The former president, however, did not disclose the conditions laid down by the insurgents. The former president said that following his discussions with the governor of Borno State that he followed up by briefing President Jonathan who he claimed, played down the capacities and conditions laid down by the insurgents. He said that at that point he withdrew as he lacked the executive powers to proceed further. Obasanjo said that given the present situation, the need to resurrect talks with the group had become expedient. “In this instance, there are now two issues involved, the insurgency and the kidnap of the girls and I want to find out if the same lawyer would still mediate,” the former president said. He said that having confirmed that the lawyer is alive, he had now set machinery in motion to reach out to the group towards releasing the kidnapped Chibok girls and thereafter ending the insurgency. Obasanjo’s secret talks is besides a secret effort by the administration to engage the Boko Haram group through three individuals reported to be close to the group. A national newspaper, yesterday, quoted presidency sources as disclosing the enlistment of a former journalist Ahmad Salkida; a Tiv, Benue State born former adherent of the insurgent group, Aliyu Teshaku and an Australian negotiator Steve Davies to negotiate on behalf of the Federal Government. The government’s decision to negotiate for the release of the kidnapped girls is reportedly informed by fears of a possible harm to the abductees in the event of a full scale military onslaught to effect their release.